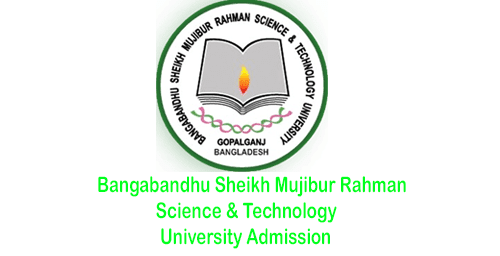 Bangabandhu Sheikh Mujibur Rahman Science & Technology University Admission Circular 2019-20. BSMRSTU Admission Circular 2019 will be publish very soon. But Admission Test will be held on 26th and 27th October 2019 for Graduation 1st Year Admission. Here is full details about BSMRSTU Admission Circular, Exam Date, Seat Plan and Admission Result. Bangabandhu Sheikh Mujibur Rahman Science & Technology University- BSMRSTU Admission Circular for the academic year 2019-20 will be publish very soon by official website. We will share the official circular in our website. candidates need total GPA 7.00 with 4th subject. At least GPA 3.00 (with 4th subject) separately in SSC or similar exam & HSC or similar exam from science group for “A” Unit. Science Group students need total GPA 6.50 in SSC or Similar and HSC or Smilar with 4th subject. Arts Group students need total GPA 6.00 in SSC or Similar and HSC or Smilar with 4th subject. For Level ‘O’ candidates will have to get minimum ‘B’ Grade in 5 subjects & Level ‘A’ must get at least ‘B’ Grade in 2 subjects. If you have these Educational Qualifications, so you can apply Bangabandhu Sheikh Mujibur Rahman Science & Technology University Admission 2019-20. Now it is time to share the application process for Bangabandhu Sheikh Mujibur Rahman Science & Technology University Admission. If you read this application process, so you can easily able to apply using our process. Firstly visit the official website, then Chose your illegible unit. This the application process for BSMRSTU Admission 2019-20. Details process coming soon! You can get a User Id after complete only application. Then you have to pay the application fee using the User ID. The last year Admission test date was 10th, 11th, 17th and 18th October 2019. But this year admission test exam date is simple different. We already told that, BSMRSTU admission test date is 26th, 27th October, 2 and 3rd November 2019. Here is full Exam Date for you. This is the BSMRSTU Admission Test Exam Date/Time Table. Every candidates will be looking for their Bangabandhu Sheikh Mujibur Rahman Science & Technology University Admission. Result will be publish very soon after complete the admission test. You can easily able to check your admission result from here like Honours Admission Result 2019. Keep your eyes in our website to get your result very fast than other. Kalerkantho Newspaper publish the Admission Test Date of BSMRSTU Admission 2019-20. Here we have share full details about Bangabandhu Sheikh Mujibur Rahman Science & Technology University Admission Circular, application process and Exam Date. We hope you guys successfully understood this post. If you like this post, so never forget to share. Thank you so much for being with us.